Sticky Boy has made a big splash on his Facebook page debut, and so many people have been asking about his whereabouts and how they can get their OWN. But what do we really know about the mysterious fellow? To satisfy the public outcry, we managed to secure an exclusive interview with the enigmatic figure. We sat him down together with Close To My Heart Founder and CEO Jeanette Lynton to find out more about who he is, where he came from, and what he’ll be doing next. Interviewer: We’re so delighted to have you both here with us for this interview. Sticky Boy, I think there are a lot of people that would like to get to know you better. Would you take a minute to introduce yourself? Sticky Boy: Oh sure. But before I do that, there’s one thing I’d like to clear up first—even though I am celebrating my tenth birthday as a clear polymer stamp this month, I’ve actually been around quite a bit longer than that. You could say I’d already been “around the block” a few times before I really became the stamp I am today. You know what I mean? Jeanette: What he means is that long before he became a polymer stamp, Sticky Boy started as a hand-drawn figure on a sketch pad. I doodled out this little figure in order to illustrate an idea I had to my husband, David, who also works for the company and has been in charge of stamp production all these years. We all liked it so much that we decided to turn him into a stamp. Interviewer: And that is how Sticky Boy was born? Jeanette: Well, not really. See, back then he was made into a wood and rubber stamp. Sticky Boy: True, true. That earliest version was not exactly what you would call a “sticky” boy. If he had had a name it would probably be “stampy boy” or something much less catchy. Jeanette: The name of the stamp was actually What’s Up, and I believe he was every bit as popular as you are now, Sticky Boy. Sticky Boy: I don’t know about that. Did “What’s Up” have his own Facebook page? Jeanette: No, but plenty of people were stamping him onto pages of their own making. It was fun to stamp a whole scene for him. 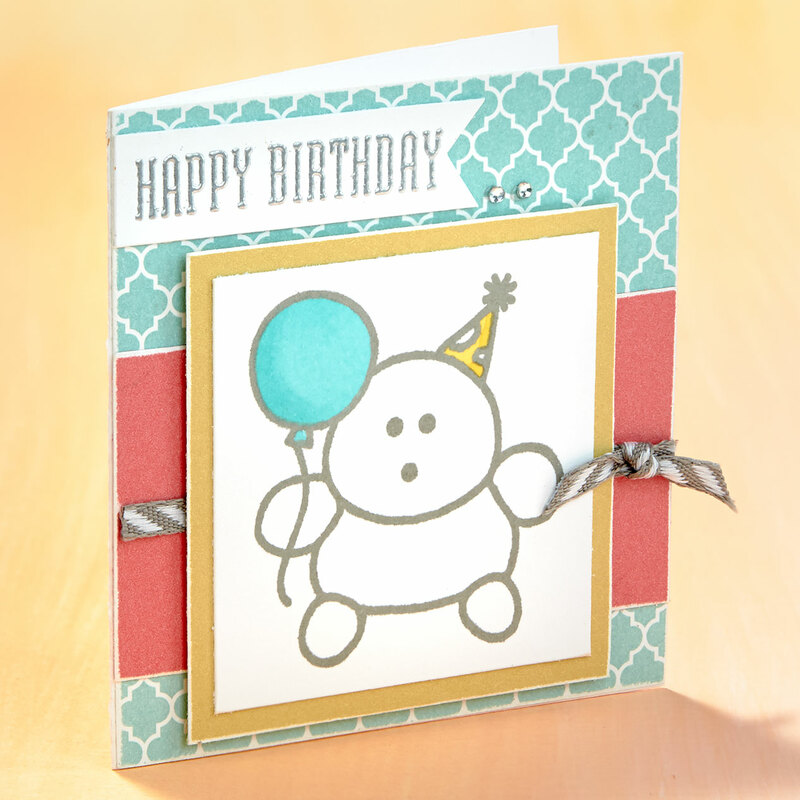 People got really creative with him and some of his friends, like another popular stamp character, Frank. 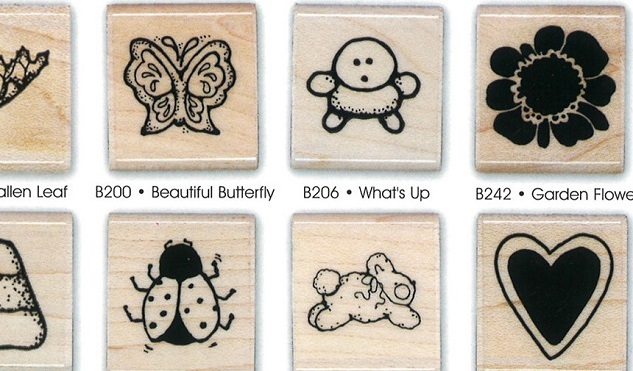 The “What’s Up” stamp from the 2001–2002 Close To My Heart Catalog & Idea Book. Sticky Boy: Please, let’s not change the subject. This is supposed to be about me. Interviewer: True, true. So how did the name Sticky Boy come about? Jeanette: Well, it was a little over ten years ago and we had made the decision to transition from wood and rubber stamps to the beautiful clear polymer stamps. We were trying to come up with a name for the new line of stamps. We were revolutionizing the industry as the first to bring this new stamp process to the direct sales market and they needed a catchy name. In a meeting, David, threw out the name “Sticky Boys.” We obviously didn’t agree on the name for our brand, but he didn’t want to let it go! Sticky Boy: I think it’s a perfectly good name! Jeanette: Of course you do, but we went with My Acrylix® instead. As part of that whole process, we were choosing which sets would make the transition and which ones would be retired. What’s Up was on the list of sets to retire because he didn’t really fit anywhere in the new collection. Sticky Boy: What you mean is that you were worried I was going to show up all the other stamp designs and make them jealous. Jeanette: Sure, we’ll say that. It was David who decided to use the What’s Up design as a prototype of the new My Acrylix® stamps. And that is really how Sticky Boy was born. David was able to keep his beloved stamp image AND his brilliant name for the new stamps. Interview: That sounds like a great partnership. Sticky Boy: Well, there are a few details she left out. See, I didn’t love being stuck to a wooden block all the time—it made it really inconvenient to go places, and one of the things I love most is traveling. I asked Jeanette for advice about what to do, and she came up with the idea for the polymer stamps. So you could almost say that I’m the one that gave her the idea. But now I can go pretty much anywhere! Interviewer: While we’re on the subject, there has been some discussion about how difficult you can be to find. Can you tell us how this little game of yours got started? Interviewer: … and that’s how a tradition gets born. Jeanette, what did you think about this idea? Jeanette: Well, I know how important it is to let David have his fun. I indulge the boys in their little game, though if I had my way, I’d let everyone take a Sticky Boy home with them! Sticky Boy: Aww, but that takes all the fun out of it! 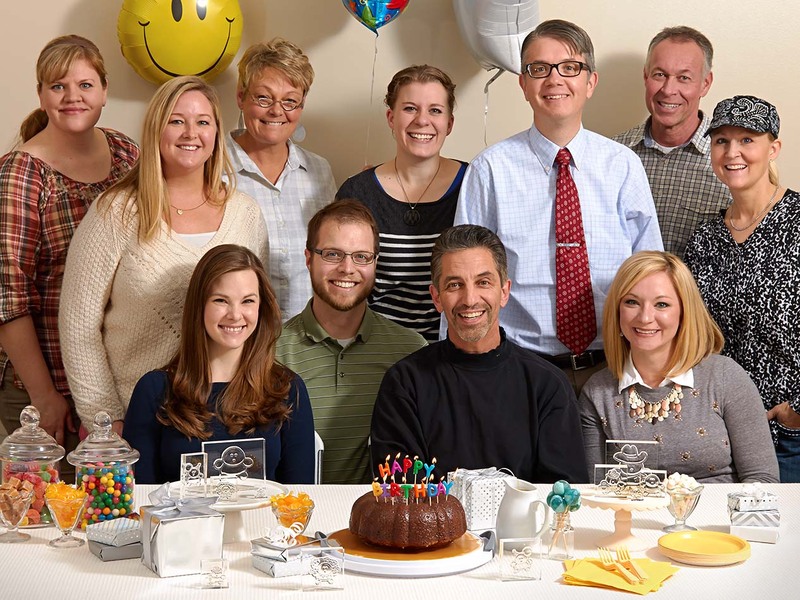 Celebration of Sticky Boy’s tenth birthday, complete with all of his favorite sticky treats. Interviewer: Well, we are running short on time. Sticky Boy, what plans do you have for the future? Sticky Boy: Well, I’m having a blast with my new Facebook page, and I have got some really fun ideas for what to do there, but other than that, the biggest thing I have planned is next year’s Close To My Heart Convention, of course. Interviewer: That’s going to be at the Disneyland Hotel® in Anaheim, California, next July, right? How will you be dressing up this time? Sticky Boy: I think I’m going to keep that a surprise for now. But yes, I am really looking forward to going back to the Disneyland® Hotel—there are so many fun hiding places there. Interviewer: When will people be able to register for the event? Sticky Boy: Our Consultants can register for Convention starting in January—so it’s coming right up! I hope everyone can come! Interviewer: Is there anything else you’d like to say before we wrap up? Sticky Boy: Oh yeah, just one last thing. I want to make sure everyone knows about the Deal of the Decade special that is going on. You can get C- & D-size stamp sets for just $10 each with a qualifying purchase. It’s a great deal going on for my tenth anniversary celebration, so I hope everyone takes the chance to get some great new stamps. I can vouch for them—they are every bit as fun to craft with as I am, even if they don’t enjoy the same level of celebrity. Jeanette: Yeah, and they don’t have quite as much of an ego, either. Interviewer: Well, thank you both very much for your time. It has been a pleasure! I look forward to seeing more of you both in the coming year. Jeanette & Sticky Boy: Likewise. There you have it! You heard it from Sticky Boy—December is a great time to get a deal on stamps, so get yours before it’s too late! Oh, and be sure to check out Sticky Boy’s Facebook page for more fun to come! Sticky Boy visits Jeanette at Convention ten years ago. Oh Sticky Boy you are so wise and well – spoken for a boy! I’m now thinking that you are older than I first thought! How do you keep your youthful complextion? I have so very many fun memories of both What’s Up and Sticky Boy thru the years! I do believe that there is a bit of David’s personality lurking in every Sticky Boy! WOW! I never knew this history. You were really cute as a What’s Up wood boy too! Thanks for sharing this great story. Who dressed up as you to meet Jeanette? What a great interview Sticky Boy!!! I’m so glad you will be at convention in 2015!!! I look forward to meeting you again! oh sticky boy, I love you so much I have been posting shakespere to you on your facebook page. Please come visit me in Australia. My humble home will be your kingdom.